For those wanting younger looking hair with radiant colour, Clairol Nice'n Easy Age Defy's three-step system gives you up to 100% long-lasting grey coverage and fights the seven signs of aging hair: Stubborn greys, lackluster colour, coarseness, frizz, unruly hair, dryness and breakage. 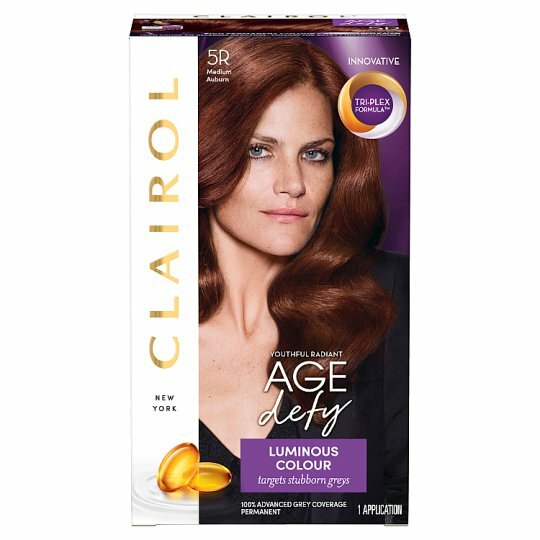 For 100% long lasting grey coverage, Clairol Age Defy 5R Medium Auburn Hair Dye, is the perfect solution to restore your colour. Discover the innovative Tri-Plex Formula, a conditioning technology that delivers strong, coloured hair to help turn back time. With the Age Defy Smoothing Pre-Treatment that softens coarse, resistant grey hair, colour gets in smoothly and our special conditioning therapy helps restore every strand to reveal stunningly soft, smooth, and manageable hair. 1. Apply the Intensifying Pre-Treat Serum  to dry hair. Put on gloves. Pour tube 2a into bottle 2b and shake.